Keep your friend's coat shiny and healthy. 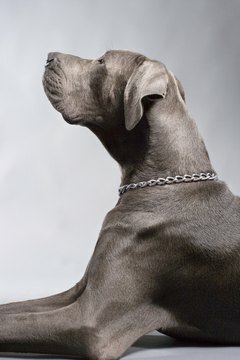 The natural blue or tan hue of the Weimaraner makes for a beautiful dog. But when that coat becomes irritated and covered in a rash, it takes away from the natural beauty—not to mention that it causes your companion misery. Often a skin rash starts from your Weimaraner scratching or licking in one particular area. This creates irritation that may lead to red, raised bumps and hair loss. After dealing with a rash for a long time, you may notice your four-legged friend stops eating or has a change in personality due to the stress, which is common in Weimaraners. Most often a skin rash on a Weimaraner is caused by an allergic reaction. Your dog may be sensitive to fleas, food, grooming products or even grass and pollen. Other causes of rashes and skin problems include staph infection caused by bacteria on the skin, and lick granuloma caused from the excessive licking this breed is known for. The cause of the licking is unknown, but it may be related to stress or boredom—Weims are extremely energetic dogs, and may develop this distressing habit if they don't get enough exercise and play. Rarely, demodectic mange mites or other parasites may be the culprits causing a skin rash on your pup. Treating the skin rash successfully requires determining what causes it with help from your veterinarian. Your veterinarian may take a skin sample and view it under a microscope to rule out bacteria or mange. Additionally, he may perform blood work to determine if allergies are the cause. After determining the cause, your vet can prescribe the best treatment, which may include an oral antihistamine or a hydrocortisone cream. He may also prescribe other forms of medication, like steroids to boost your pup's immune system. Food allergies will, of course, require a change of diet; wheat and corn, present in many dog foods, are common culprits. For parasites, your vet will advise you on using medicated dips and shampoos. As with humans, an ounce of prevention is worth a pound of cure. Consider your Weimaraner’s sensitive skin when choosing grooming products like shampoo. An oatmeal and aloe formula for sensitive skin may work best. Also, feed your pup a high-quality food—your vet can advise you. Avoid fillers and chemical preservatives. Keep his living area clean and dust-free. And of course keep your furry friend’s vaccinations up to date for optimal health.